July 28: The Siege of Rhodes. Victory over the Turks by the Knights Hospitaller at Rhodes in 1480 through Our Lady’s intercession. Constantinople, the capital of the Byzantine Empire, the last remnant of the Holy Roman Empire, fell to the “Scourge of Europe,” the Sultan Mehmet II, in the year 1453. This dire news was almost impossible to believe in the rest of Christendom, but it was sadly true, and Constantinople was made into the new seat of the Ottoman Empire. A few short years later, Pierre D’Aubusson was Grand Master of the Hospitallers, the Knights of Saint John, living on the island of Rhodes. 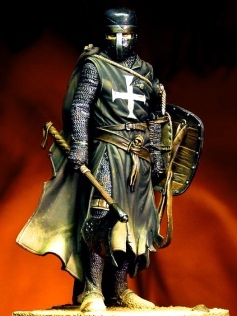 He and his knights were untiring opponents of Islam, sworn to do everything in their power to fight against them. Having made the island of Rhodes their home, the knights harassed Ottoman shipping lanes and assisted with attacks against the Ottoman Empire. In the year 1479, D’Aubusson refused to pay tribute to Mehmet in exchange for peace, and furthermore, had the audacity to continue harassing the sultan's shipping lanes. The Grand Master continued to work on the massive fortifications on Rhodes as he awaited the siege of Rhodes that he knew would soon come. His walls were strong, but the Grand Master had only a few hundred knights and about 2,000 natives to defend them. Mehmet was not intimidated by the Christian defenses on Rhodes, for he had huge cannons and basilisks which had blasted holes in the stout walls of Constantinople. He also had over 70,000 men in his army, and he was determined to wipe out “that abode of the sons of Satan,” as he referred to the Catholic knights of Rhodes. Breaches were eventually made in the walls, and the Muslim’s unremittingly attempted to rush through the breaches. Many of the Turks had to be forced to attack the defenses, as their commanders lashed them forward with whips and chains. The Janissaries, however, did not have to be urged, for they were the sultan’s finest troops. They were warriors to the core, and advanced over the fallen bodies of their comrades, anxious to cross swords with the Catholic knights. Finally, the Tower of Italy began to crumble from the terrific assault, and large breaches opened in the wall. The Bashi-Bazouks and Janissaries rushed into the breach, placing the standard of Islam above the tower. On witnessing this act, the Grandmaster rushed into the breach together with a few of his excellent knights. Howling and raging like madmen, the Janissaries pressed the assault, for the knights seemed too few to stand against their wave after wave of thousands of elite warriors. Yet the Grandmaster stood, insensible of any wounds he received in return for the carnage he wreaked among the fanatical Muslim warriors. Fighting with broken blades and notched axes, the Knights of Saint John continued to hold the breach, cutting down any who approached them, until a huge Janissary rose up and hurled a spear with all his might directly at the Grand Master. Propelled at incredible speed, the sharp steel tip easily pierced D’Aubusson’s breastplate, puncturing his lung. The Grand Master went down beneath a torrent of hacking blades as the knights struggled to drag his body from the fray. By his courageous stand D’Aubusson had proven he was at least the equal of any Grand Master in history, but now he was wounded unto death and could do no more. The siege of Rhodes appeared to be lost as D’Aubusson’s knights struggled to haul him to safety. Thousands of Jannisaries were rushing into the breach with no one to stop them, and at this point the knights knew it would take a miracle to keep Rhodes from being overrun. A miracle is exactly what they got. Suddenly there appeared in the sky “a refulgent cross of gold, by the side of which stood a beautiful woman clothed in garments of dazzling white, a lance in her hand and a shield on her arm, accompanied by a man dressed in goatskins and followed by a band of heavenly warriors armed with flaming swords.” It was the glorious figures of Saint John the Baptist, the Patron Saint of the Order of Saint John, Saint Michael the Archangel brandishing his unsheathed sword, and the Queen of Heaven, the Blessed Virgin Mary herself, dressed in battle array! The Turks turned at the sight and ran in panic-stricken flight. Thousands fell as they fled, cut down and pursued through the breaches by the knights of Rhodes and their heavenly allies. Chased all the way back to their camp, it was now the defeated Muslims who suffered the insult of having their sultan’s own standard captured. The siege of Rhodes had ended, and Grandmaster D’Aubusson later recovered of his wounds. He had lost 231 of his knights, but that was nothing compared to the thousands upon thousands of Muslim warriors who lay dead upon his shores. It was in the year of Our Lord 1480 that the knights of Rhodes had gained this signal victory over the Turks, by the help of the Blessed Virgin, whom the Knights regarded ever after as Our Lady of Victory. They renewed their dedication to her who had appeared on the walls during the siege of Rhodes holding a lance in her hand to defend them, bringing with her Saint Michael the Archangel and a heavenly army. She, the Patroness of the Sovereign and Military Order of Hospitallers, had turned the formerly obstinate enemy, who retired in disorder to lose the greater part of their army. Thanks to Our Lady of Victory, the all-conquering sword of Mehmet II had shattered upon the walls of Rhodes!